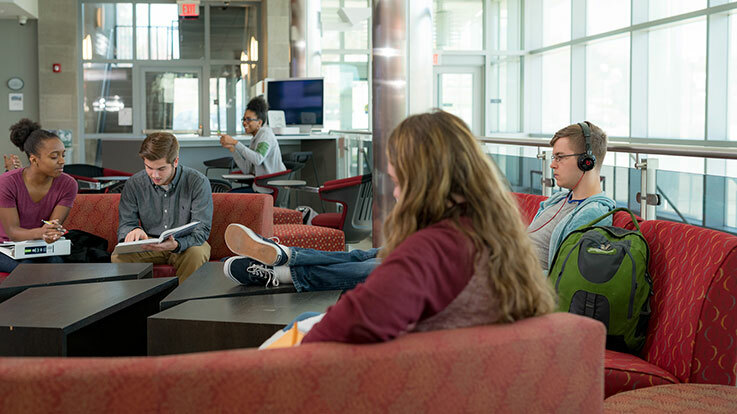 Cecil College provides several options for our students to study, relax, or grab a bite to eat while on campus. A community space available for students to gather, study, eat, watch TV, or just relax. The APG Federal Credit Union at Cecil College is also located here. Offers a variety of food and drink options including fresh fruit, salads and yogurt, sandwiches, pizza, snacks, and a large selection of beverages including coffee and fountain sodas. A space for club meetings, gaming, or quiet studying. Students can checkout paddles and ping-pong balls from the Student Life Office in Room 114. Dedicated space for campus and community resources. A great place for our veteran students to study or meet other veterans on campus. A private space located in the Student Life Office that can be utilized as a quiet study area, a lactation room for nursing mothers, or a place to relax between classes. Provides a device charging station, campus resource and activities information, board games, and much more! The cafe is located on the North East Campus on the first floor of the Technology Center and offers many delicious products. For more detailed info and prices, see the full menu. Created as a unique, new partnership between a community college and a credit union, the APGFCU collegiate branch offers services to the Cecil College community and all local customers. Beyond providing students with easy access to banking services, APGFCU fulfills its mission to make financial education an empowering part of every member’s life by partnering with Cecil College’s faculty to bring expert advice and real-world experience into the classroom. The branch is the site of growing partnerships with cybersecurity, marketing and, of course, finance classes.